The cameras are furnished with lenses with an extreme wide-angle Field of View (FOV > 180°) which cause the fish-eye distortions in output video. Furthermore, each camera captures the surroundings from the perspective defined by its installation point. That perspective must be transformed into a perspective suitable for the Panoramic View display. Each camera covers more than 180° of the surrounding area, which means that captured input video streams overlap. Seamless 360° Panoramic View requires precise definition of stitching borders between three video inputs combined in the final video outputs. 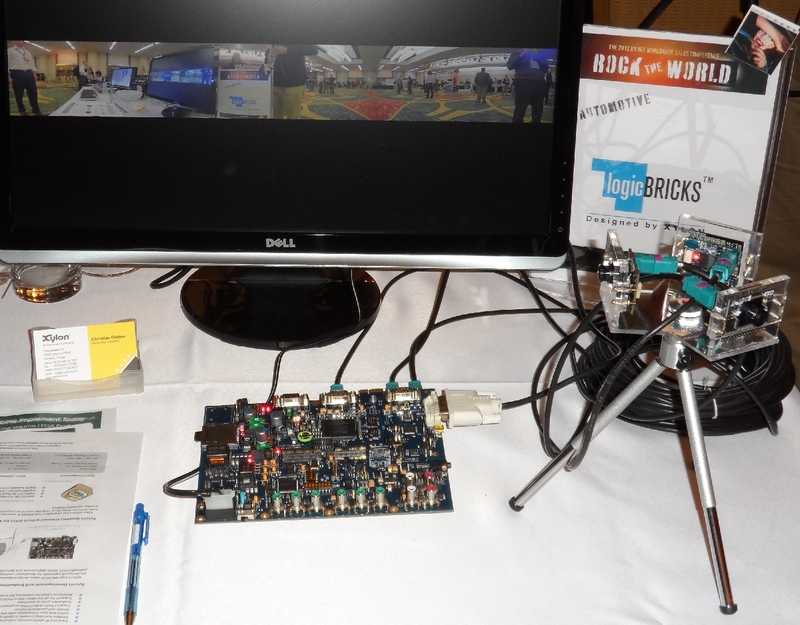 Xylon logicBRICKS IP cores remove lens distortions, make perspective corrections and the final image stitching. The IP cores must be properly configured and the whole Multi Head Camera must be calibrated. Xylon currently does not offer market ready calibration software for this demo. For lens corrections (calibration) Xylon uses the calibration software developed for the Surround View Parking Assistance Driver Assistance. Perspective transformations and stitching zones are also calibrated by internally developed software. The bellow images are inputs and an output from the calibration software. Camera 1 - 3 are input video images with the described image distortions. The resulting Panoramic View image shows preview output from the calibration software, which generates initialization data and video transformation tables for use with the Xylon logiVIEW IP core. Please note that the calibration software uses grey-scale images, while the demo camera shows full RGB video. The previewed output has non-uniform image brightness and contrast, since the calibration software does not regulate it. The demo system uses High Dynamic Range (HDR) cameras to provide the highest quality video image.